Showing results for tags 'jeep cj-5'. Yesterday, my Rinky Dink Jeep tried to kill me. The on-going saga of my efforts to resuscitate this long forgotten and abused CJ5. After a week or two spent squirting Sea Foam & JB Blaster in the cylinders I actually got it running on Saturday. I had gone through the fuel system completely, from filler hoses to the carb. Everything is either new or re-manufactured, with the exception of the hard lines which were flushed with acetone. Primed the fuel system. New cap, rotor, wires, plugs gapped. Cranked and it fired. It was apparent that the timing was way retarded, as it barely ran at idle and died with any throttle given. Figured to set the timing only to discover the distributor seized solid. "Like a rock' as the Chevy guys would say. Turns out the distributor is also sitting proud of the housing by 8-10mm. It has been sitting like that at least for 10 years, without a hood, in the So Cal Inland Empire. Hmm. Alum on Alum out where the sun and the stars shine. Not good. Anyway, tried all the usual, tapping up, down and sideways. Soaked in JB Blaster. Even the Milwaukee hot air gun. It wouldn't budge. Sat night decided to try the 50/50 Acetone & ATF Miracle cure. Wrapped a shop rag around the shaft and let it sit over night. My restless ponderings while horizontal led me to believe that I needed more heat. Bright and early Sunday AM, with a cup of joe in one hand and a propane torch in the other, I uncover said jeep and dry off the area. I didn't so much as touch the flame to the housing when it ripped off a huge bang. Blew the valve covers off the heads. That was unexpected! Proud to say didn't spill any of the precious from the cup. Neighbor at the end of the street heard the bang and looked in time to see me standing there with a smoke cloud above me. Obviously set off the internal fumes. Never in my 48 years of playing with engines has this ever happened to me. I may be a bit slow but I eventually figured out that the distributor hold down bolt is through drilled into the timing case cavity and I flashed it off, twice. Did it a second time today to a lesser degree. That is when I deduced the through drilling. Sharp as a marble one might say. Anyway.. the damn distributor is still stuck. I rigged up a small slide hammer today and tried popping it. Still nothing. NOW the question; Is it possible to remove the oil pump and drive the distributor out via the bottom?? 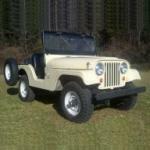 I have a 1980 CJ5 with the factory 304 and T-176 4 speed. I need to make it California compliant. A couple of questions I need answers for. 1) Was there a difference between the Federal and California emissions equipment in 1980? 2) Anyone know of a source for the emissions sticker located on the radiator support. I can't locate the correct V-8 one. Thankfully it still has most of the original pollution control system in place. All it needs is the sticker and a revert back to a 2-1 exhaust with a Cat. Calif now requires Calif specific converters but I believe 1980 was before this regulation. There you go, Moses! It's going to be my first attempt at an engine rebuild... Starting the tear down. This Jeep spent most of its driving life on a tow bar being towed to NY for the hunting season. The engine has very low actual miles on it. Welcome to the AMC/Jeep CJ and Jeepster Forum! By 1972, AMC/Jeep Corporation was in full swing, producing the new generation Jeep 4x4s! This era represents the legendary CJ models that grew the brand to new heights and set benchmarks for engineering, design and sales. Join others who own and appreciate this unique group of vehicles, the 1972-86 CJ-5, CJ-6, CJ-7, Scrambler/CJ-8 and third generation AMC/Jeep Jeepster/Commando models!—Moses Ludel Moses Ludel's second Jeep® CJ Rebuilder's Manual, covering 1972-86 AMC/Jeep® models. These years brought the Jeep CJ to the forefront, and consumers flocked to outdoor lifestyles and the popular sport of four-wheeling! An AMC/Jeep CJ does well both on- and off-highway, often with plenty of power, driving ease and comfort to spare! While waiting for the transmission parts to come in I disassembled the Transfer case. It went pretty easy. The only issue I had was when I removed the intermediate shaft I could not remove the intermediate gear as the book says I could. I had to wait until I slid the main shaft back a bit to remove the gear. The intermediate gear hit the side of the case. Not sure what I did wrong . I tried it in every gear. 1955 Jeep CJ5 Tub, Frame, Axles and Gear Train Rescue! Welcome to the Vintage Jeep® 4x4 Forum! In the postwar era, Willys pioneered the development and production of 4WD light trucks and the World's first "sport utility vehicles". If you like the WWII and postwar Willys and Kaiser era Jeep models, this forum provides a community of enthusiasts and restorers. Whether your interest is history, restoration, rebuilding, how-to, troubleshooting or sharing vintage Jeep 4WD experiences, you'll find support and build friendships here!—Moses Ludel At left is a Mopar flyer for Camp Jeep workshops by Moses Ludel. The red '55 CJ-5 was the project built and depicted within the book at right!